Двигатель Стирлинга представляет собой тепловой двигатель изобретенный Робертом Стирлингом в 1816 году. Он отличается от двигателя внутреннего сгорания, потому что топливо сгорает вне двигателя, что делает его гораздо проще в изготовлении. Есть двигатели Стирлинга, которые работают от тепла ваших рук, хотя их немного сложнее построить. Двигатель Стирлинга будет неплохим дополнением к любой коллекции любителей делать вещи своими руками. Основной принцип работы двигателя Стирлинга заключается в постоянно чередуемых нагревании и охлаждении рабочего тела в закрытом цилиндре. Обычно в роли рабочего тела выступает воздух, но также используются водород и гелий. В ряде экспериментальных образцов испытывались фреоны, двуокись азота, сжиженный пропан-бутан и вода. В последнем случае вода остаётся в жидком состоянии на всех участках термодинамического цикла. Особенностью стирлинга с жидким рабочим телом является малые размеры, высокая удельная мощность и большие рабочие давления. Существует также стирлинг с двухфазным рабочим телом. Он тоже характеризуется высокой удельной мощностью, высоким рабочим давлением. The diaphragm of this engine is made from a balloon (just an ordinary one, nothing special!). It’s reinforced with a piece of inner tube in the centre First of all cut the neck off a balloon and stretch the balloon end over the top of a can. Then cut a piece of inner-tube rubber about 1cm square and glue it in the centre of the balloon. 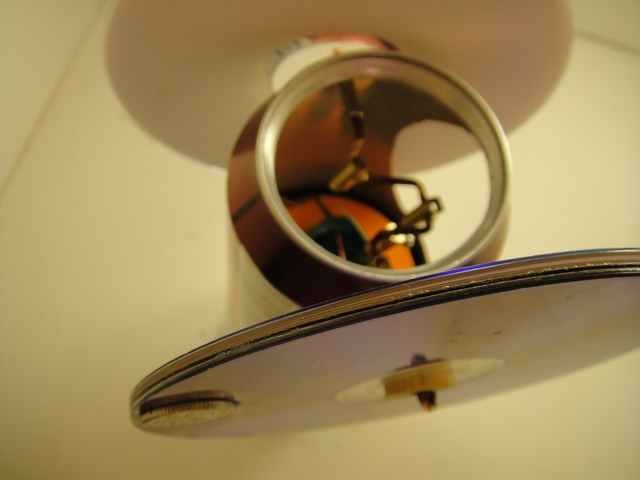 Then cut either side of the bottle cap into a curved shape, this is because sometimes the displacer wire holder flicks to the side a little and it may hit the cap – This is more of an annoyance than a real problem, but you might as well prevent it if you can! Plus I think it looks better with the curves. 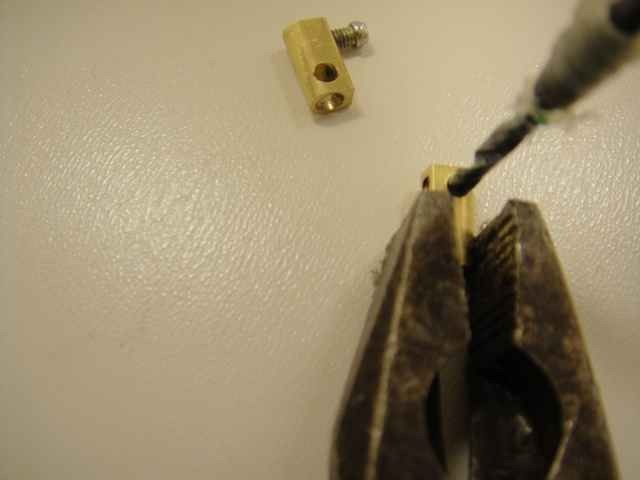 I used tin snips here – they work well for cutting this thick plastic. 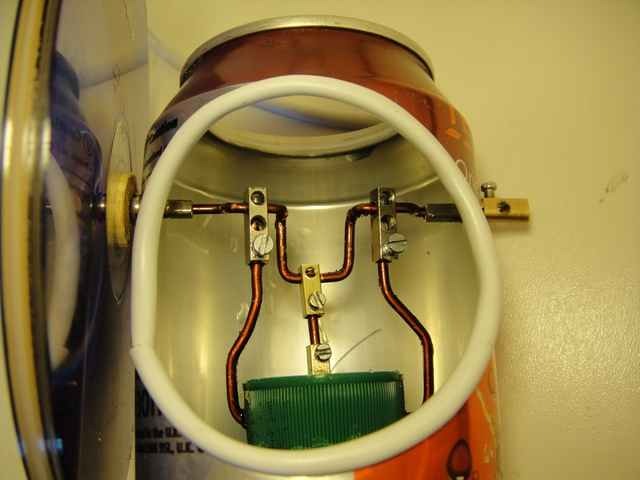 Now remove the diaphragm from the coke can and flip it over so that the inner-tube is on the inside of the can. 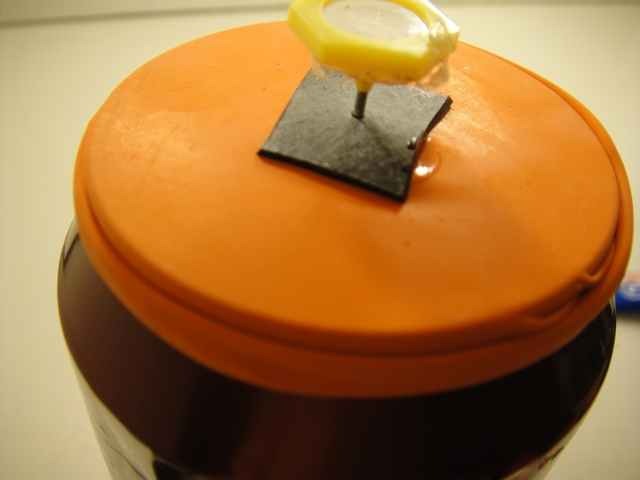 Glue the bottle cap to the side of the diaphragm that does not have the inner-tube reinforcement. I sanded the bottle cap a little as I found that the glue doesn’t like to stick to this plastic. 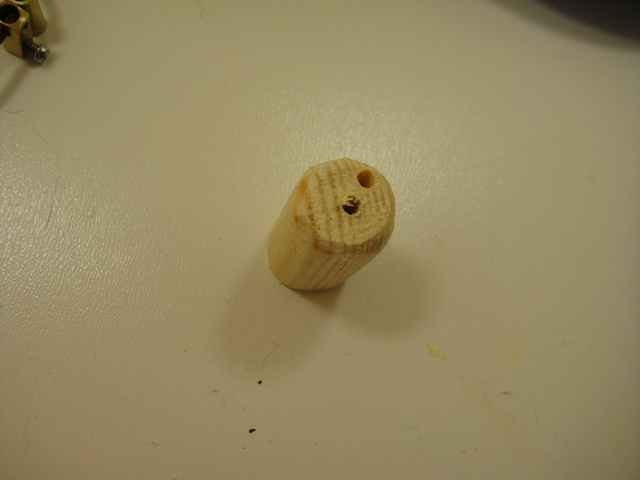 I used a long 3.5mm drill bit to drill the bearing holes. I just drilled them by eye, no need to measure anything. They should be near the top of the can where it bevels in. Make sure that they’re roughly level. Next, mark a circle roughly in the centre of the can, so that you can see the cranks/displacer wire etc. It doesn’t have to be a circle, but that makes fitting the trim easier. For the cranks I used some 1.8mm (approx – I don’t know the exact size) copper wire – you can use old spokes, or steel wire, if you don’t have copper. I used copper because it’s easier to bend and I like copper. 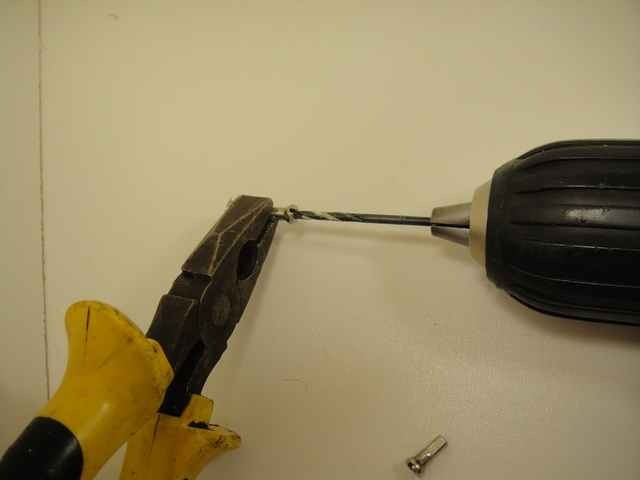 If you need to straighten the copper wire you can clamp it in a drill and hold the other end with some pliers – spinning the drill should straighten the wire. Make sure you wear some decent safety gear though, in case the wire slips! I’ve included photo’s of every step of bending the cranks below. The displacer piece should protrude about 20mm and the other parts protrude about 5mm, no need to be exact though. 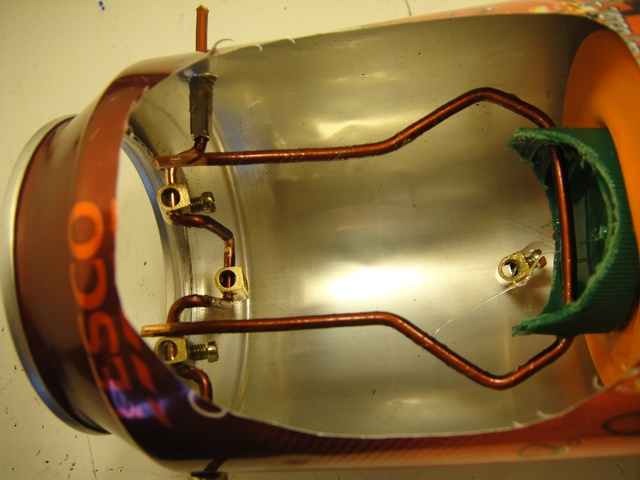 The displacer part is at 90 degrees to the push rods – this is the best angle for this engine. The electrical blocks are fitted as you bend the cranks, be careful to make sure that they all point the same way, as you won’t be able to access the screws from the viewing window. Now you can thread the cranks though. You can thread them through the viewing window at an angle. If you can’t fit them through you can cut one end down a little until they do. You need to leave one end of the cranks long for the flywheel attachment though. The bearings should be a tight fit in the holes but if they are loose you can glue them in place. 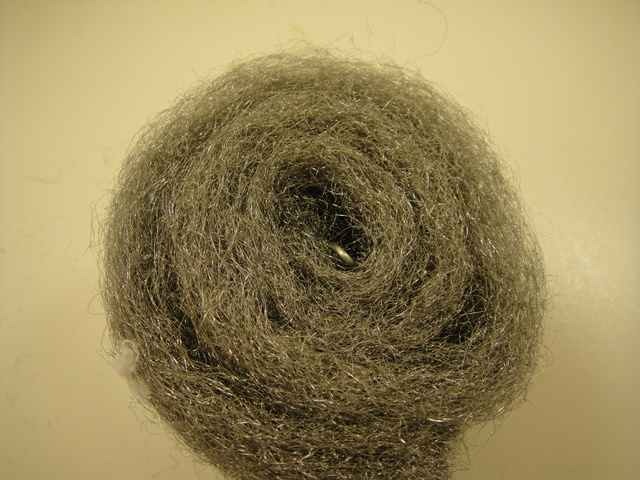 The displacer is made from steel wire wool wrapped around around a piece of steel wire. Bend a small hook in the end of the wire and begin rolling steel wool around this. 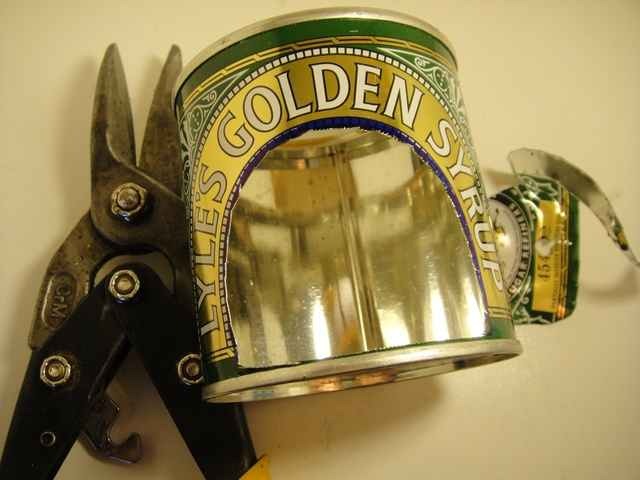 Once you get near the size of a coke can, cut the wool. Pull out the wire most of the way and cut the wool so that the displacer is around 2 inches high. On the other end of the wire (not the hook end – bend a spiral, this is just to give the wire more surface area so it can’t be pulled out. 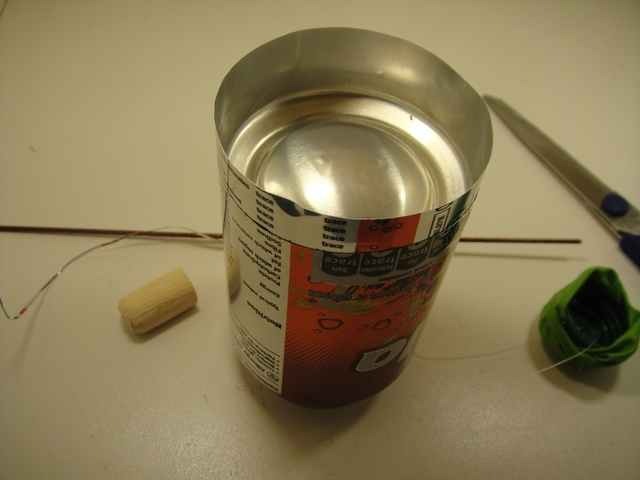 Finally trim a slight bevel around the top to match the bevel on the coke can. 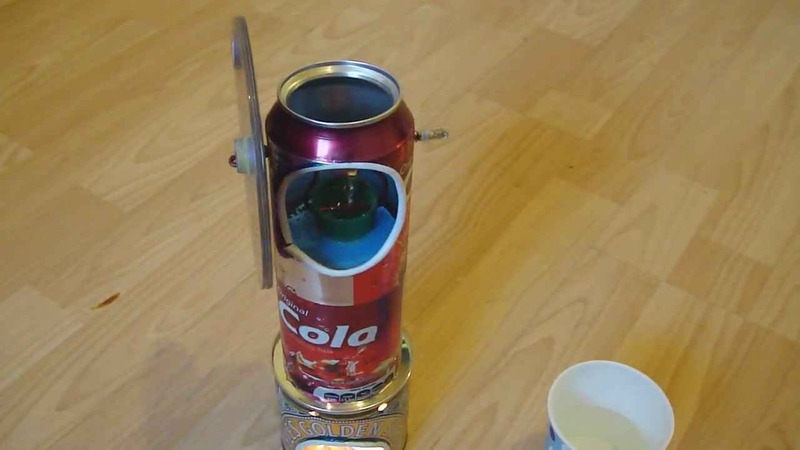 You can test the displacer in a coke can now – it needs to fall freely under it’s own weight. You can spin the displacer inside of the can to smooth it out. 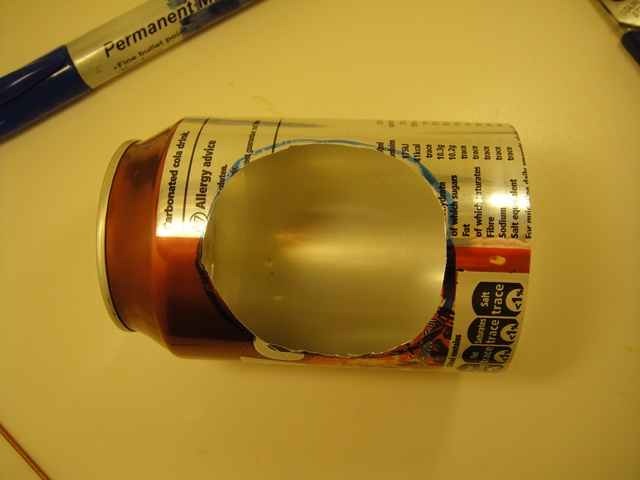 Try and make the spiral roughly into the shape of a coke can dome. Once your happy with the displacer movement you can tie about a foot of fishing wire onto the hook end of the displacer. Apply some super glue to the knot so that it can’t wriggle loose when the engine is running. Now fit the balloon over the top it should not be tight or loose – just tight enough not to sag. 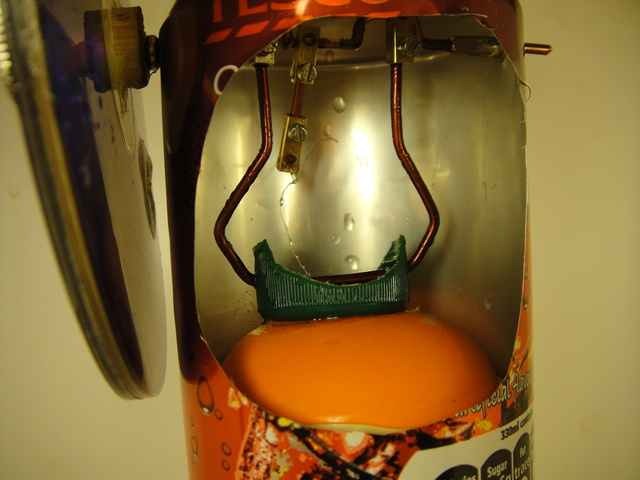 Take an electrical connector that is not drilled and tie the fishing line through the screw hole about an inch above the bottom of the bottle cap – make sure that the displacer is at the bottom of the pressure vessel by tapping it on the table. Glue the knot so that it can’t come lose. 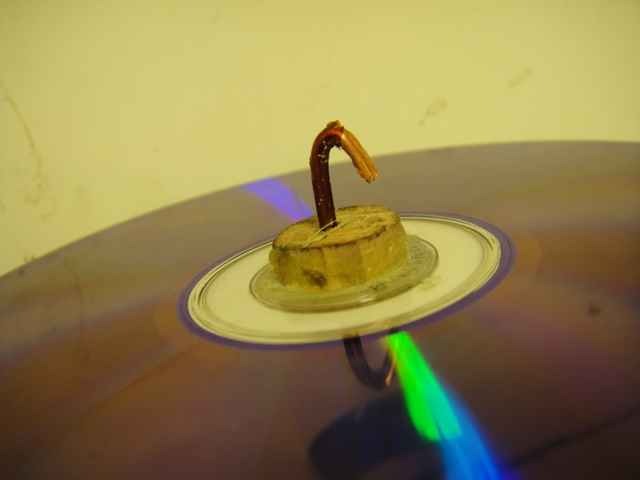 Apply a drop of oil to the wire and check that the displacer can be pulled easily and that it falls easily pulling the wire with it. 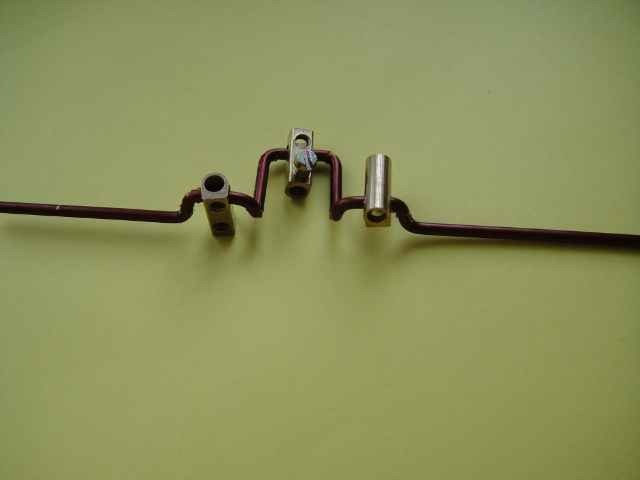 Now you can connect all of the parts together. 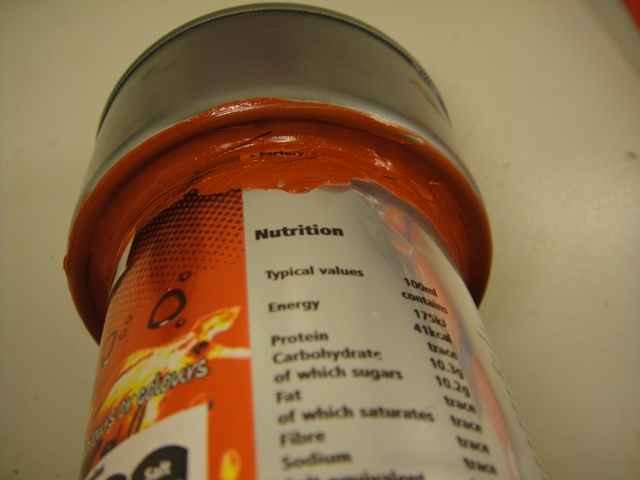 The can with the cranks is pushed onto the top of the pressure vessel, don’t push the can from the very top at the front as this will crush the viewing window, instead push it from the bottom edge of the viewing window. You need to push it down about 4mm. Now you can test the engine (at last!) . Light some candles and test! Hopefully it’ll work first time, but if not heres some tips that might help. 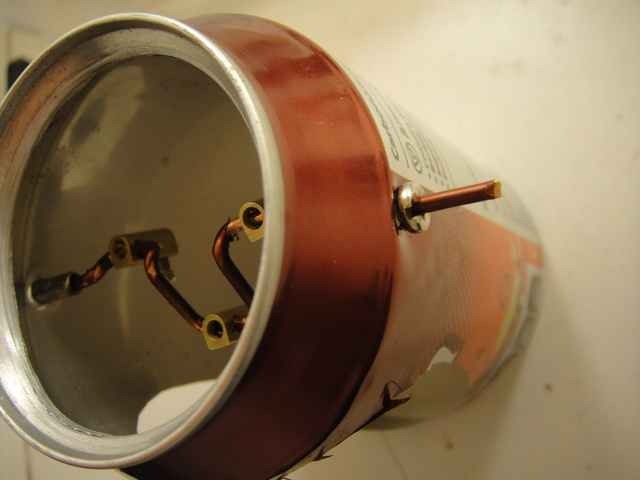 Don’t forget to oil all the moving parts so it runs smooth particularly the fishing line. Too much friction: Does the engine turn reasonably freely? There will always be some resistance from the balloon stretching a little, but it should spin once or twice on it’s own if you give the flywheels a quick flick. 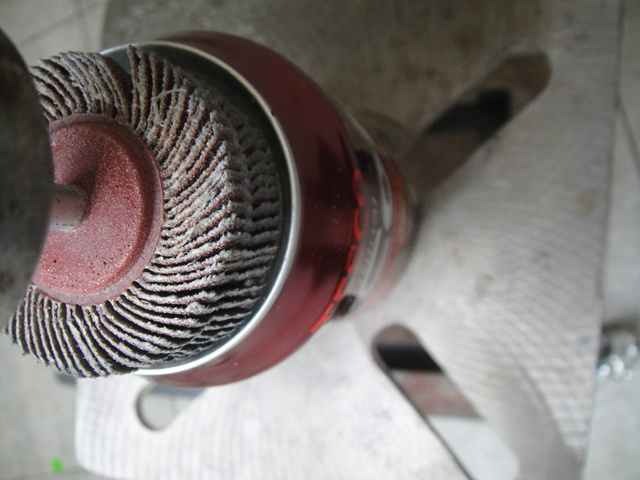 Engine is “too” air tight: If the engine is perfectly air tight then the air in the dead space will expand causing pressure in the engine which the normal movement can’t overcome. The symptom of this is that the balloon just bulges out no matter where the displacer is. 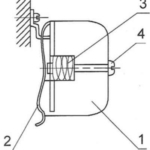 The solution to this problem is to fit a small piece of fishing line under the edge of the diaphragm, this creates a tiny leak which lets the excess pressure out. 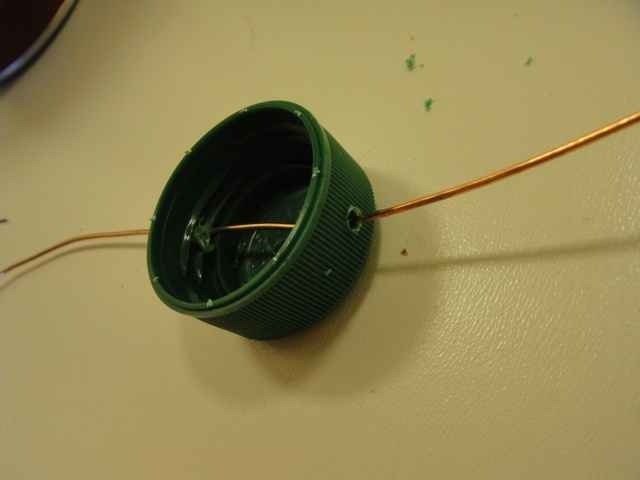 Over time the displacer wire seal will wear down a little and you should be able to remove the artificial leak. 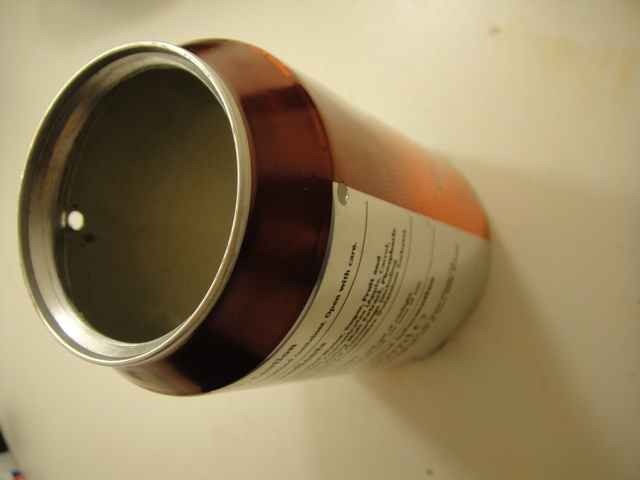 You can’t fill the space between the top of the cans with water if you have done this as the water will seep in. Step 19 Add a cooling jacket and possibly a generator.